İzmir (Turkish pronunciation: [ˈizmiɾ]) is a metropolitan city in the western extremity of Anatolia and the third most populous city in Turkey, after Istanbul and Ankara. It is the second most populous city on the Aegean Sea after Athens, Greece. In 2014, the city of İzmir had a population of 2,847,691, while İzmir Province had a total population of 4,113,072. 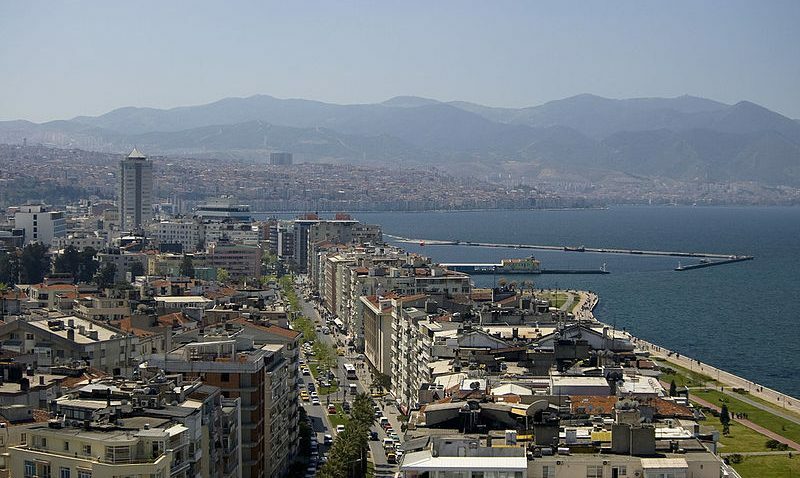 İzmir’s metropolitan area extends along the outlying waters of the Gulf of İzmir and inland to the north across the Gediz River delta; to the east along an alluvial plain created by several small streams; and to a slightly more rugged terrain in the south. In classical antiquity the city was known as Smyrna (Greek: Σμύρνη Smyrni [ˈzmirni]), a name which remained in use in English and other foreign languages until the Turkish Postal Service Law (Posta Hizmet Kanunu) of 28 March 1930, which made İzmir the internationally recognized name. İzmir has almost 4,000 years of recorded urban history and even longer as an advanced human settlement. Lying on an advantageous location at the head of a gulf running down in a deep indentation, midway on the western Anatolian coast, it has been one of the principal mercantile cities of the Mediterranean Sea for much of its history. İzmir hosted the Mediterranean Games in 1971 and the World University Games (Universiade) in 2005.